This section contains settings related to global illumination including SSAO (screen-space ambient occlusion), SSGI (screen-space global illumination) and bent normals. The SSRTGI (Screen-Space Ray-Traced Global Illumination) technology is a set of screen-space ray tracing techniques with real-time performance level. The technology doesn't require light baking, so every object can be freely moved. In other words, SSRTGI is real-time global illumination in the screen space. The technique implements a real ray-tracing through each pixel of the screen, with a given number of rays and a specified accuracy of obstacle detection (the accuracy is set by using steps). Such ray-tracing is used for Ambient Occlusion (SSAO) to make more realistic shadows between objects, for Bent Normals to smooth ambient lighting on edges, and for SSGI to recreate light reflections from the object's surfaces. For the technique to take an effect, the SSRTGI (Screen Space Ray-Traced Global Illumination) feature must be enabled (Rendering -> Features -> SSRTGI). Toggles SSRTGI on and off. Toggles fast tracing for the SSRTGI on and off. This option dynamically changes step size to obtain indirect illumination bounces using low number of steps while keeping performance high. However, tiny objects may be ignored. Disabling this option improves quality, but significantly reduces performance. 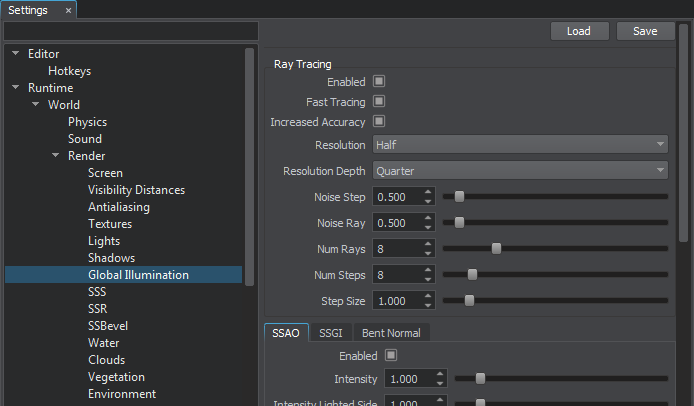 Toggles increased accuracy of ray tracing for the SSRTGI on and off. This option reduces visual artifacts by increasing accuracy of the last step. Resolution of the SSRTGI. This option significantly affects performance. At low values, edges of objects become blurred. Resolution of the depth buffer used for SSRTGI calculation. This option significantly affects performance. Quarter - quarter resolution (by default). To gain performance, this option can be set to lower values while enabling the Increased accuracy option. Intensity of the step noise used for SSRTGI calculation. This parameter is used to reduce the banding effect of tracing by using the noise: the higher is the value, the less pronounced is the banding effect. Intensity of the ray noise used for SSRTGI calculation. This parameter is used to reduce the banding effect on the final image by using the noise: the higher is the value, the less pronounced is the banding effect. Number of rays of SSRTGI traced per pixel that are used to calculate the final image. Using more rays provides more precise SSRTGI calculation and smoother picture, however, it is more expensive. Number of steps of SSRTGI per ray that are used for trace calculation. The higher the value, the further the tracing is performed, resulting wider gradients. However, this option significantly affects performance. Size of the trace step used for SSRTGI calculation. The higher the value, the longer the trace and the more accurate obstacles are accounted. Increasin the value results in smoother gradients on small objects. However, tiny objects may be missed. The lower the value, the more detailed the tiny objects will be .